Will the Economy Be Ahmadinejad's Downfall? President Mahmoud Ahmadinejad appears to believe that only desperate measures on the economy can save his presidency when Iranians go to the polls in June, but he suffered a shocking setback on Monday when the legislature dominated by like-minded conservatives blocked his key initiative. 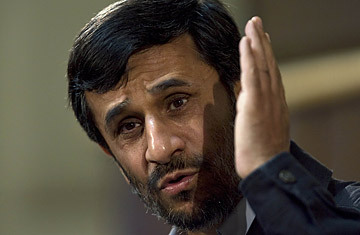 Ahmadinejad had proposed legislation in the Majlis, Iran's parliament, that would have summarily withdrawn government subsidies on oil, gasoline and electricity, freeing up about $20 billion in government funds, of which he planned to transfer more than half in direct cash handouts to middle- and lower-income households. But the move would have sent energy prices skyrocketing in Iran, and the Majlis was having none of it  despite the vote being widely viewed as a test of conservative loyalty ahead of the June poll. Despite months of heated debate, Ahmadinejad had been expected to carry the vote on eliminating subsidies, and his supporters were shocked when the legislation was defeated by a vote of 132 to 102. "This vote ... shows Ahmadinejad can no longer count on the unanimous support of the fundamentalists in the upcoming elections," says Saeed Leylaz, a political analyst in Tehran, adding, "It could even mean that the Supreme Leader no longer unequivocally supports him." The government insisted its legislation was based on "economic justice," and would, as the official IRNA news agency had it, "prevent subsidies from going to the high-income layers of society and direct the country's resources toward increasing the welfare of the lower strata." The news agency said it would have given the average household of four a cash payment of about $90. But the legislators appear to believe the electorate is not buying the government's argument. "Majlis has probably gauged that Ahmadinejad no longer enjoys the support of the people and decided not to put its bets on a dead horse," says the Tehran-based analyst Leylaz. Economists have accused Ahmadinejad of mismanaging the oil windfall of recent years and adopting policies that have unleashed rampant inflation and failed to create jobs. "Ahmadinejad doesn't believe in the science of economics," says Hossein Askari, business professor at George Washington University. "He has taken the oil money and handed it out on his visits to the provinces. The economy can't sustain that. It's Econ 101. You deplete the country's natural resources, you're left with nothing and you have a huge problem." Askari says the government's decision to spend oil moneys to artificially prop up the value of its currency against the dollar despite rampant inflation has benefited the wealthiest Iranians, many of whom made huge fortunes in real estate speculation and then moved their money out of the country. "Over the last seven years, Iran has had an incredible $250 billion in capital flight, mostly to Dubai," he explains. The dangerous irony confronting Ahmadinejad is that it was his ability to tap into economic grievances with populist promises that got him elected four years ago, but the economy by almost every measure is far worse today. And that fact won't be lost on voters. "Ahmadinejad has not done as well as [his reformist predecessor President Mohammed] Khatami with twice the oil revenue," says Virginia Tech economist Djavad Salehi-Isfahani. The Brookings Institution scholar says according to his data, the gap between poor and rich has worsened during Ahmadinejad's term, despite his promises of economic justice. The populist President has actually managed to make his predecessor's economic performance look good by comparison. And, of course, Khatami is among the candidates running against Ahmadinejad in June. "Oil revenues were so much lower during Khatami's time, and yet we never felt like life was as unaffordable as it is now," says 30-year-old accounting student Maryam Ahmadi, walking past Tehran University in city center, adding, "Ahmadinejad has brought expectations down to zero." Dissatisfaction is high across Tehran. Mehdi, 27, the owner of a men's clothing store in the bazaar, says, "I voted for Ahmadinejad, but he didn't keep his promises. People don't have money anymore. We had money and got loans, then inflation went so high that we can't pay back our loans. Whoever comes after Ahmadinejad needs four years to clean up his mess before doing anything else." And that's a sentiment Khatami's campaign hopes will translate into a comeback for the reformist former President. "People now compare the eight years of Khatami with four years of Ahmadinejad and realize that his policies were better for both the country and its people," says Khatami adviser Mostafa Tajzadeh. "And that's although Khatami wasn't making slogans only about the economy, like Ahmadinejad has." The problems today run so deep, however, that it may be beyond any government to fix them without the nation suffering a period of protracted, and politically dangerous, economic pain.